How can I eat healthy without going broke or spending hours in the kitchen? My kitchen is my happy place, and I love spending lots of time there, but I know that time and patience to cook tend to be on the short side for most people. Yup! It was that quick! After his first bite, he gave me an “Oh yeah” and said this is one of his new favorite dishes. Success! 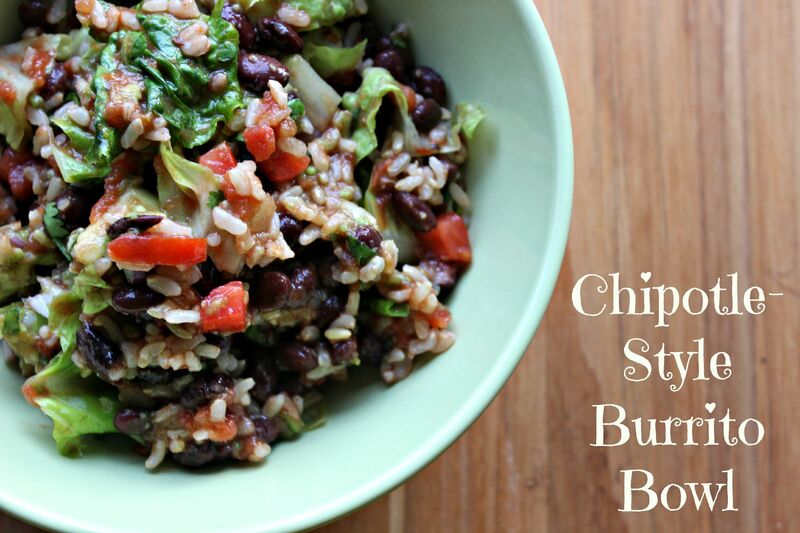 If you like Chipotle or Qdoba but don’t want to spend $8/person on a meal, this could be a new “go to” recipe for you. I bet it will become one of your favorites! Here are a few keys to keep in mind when making your own quick and healthy meals, which served as the motivation to test out this recipe! Cook more, dine out less. You will almost always pay more to dine out than to make a meal yourself. On average, a McDonald’s dinner for a family of four costs almost $7/person compared to a dinner based on rice and beans, like this one, which costs less than $2.50/person. Make some of your meals meatless. Meat and dairy products and processed foods tend to be some of the most costly items on a grocery bill. Swapping out meat with beans – even one day a week – can help you save money…and time! Eat vegan before 6:00 p.m. Mark Bittman was given the choice to either go on medication or adopt a vegan diet. He didn’t want to do either, so he started eating vegan before 6:00 and then having smaller portions of high quality animal products at dinnertime. He lost 35 pounds and didn’t have to go on medication. Click here to learn more about his story and book. In the meantime, check out this awesome recipe! This is one of the most popular recipes on my blog and is always a crowd pleaser, even for people who claim to dislike beans and avocado! It's also one of the cheapest meals you can make for a group! 2 cups cooked brown rice heat up a precooked frozen bag! 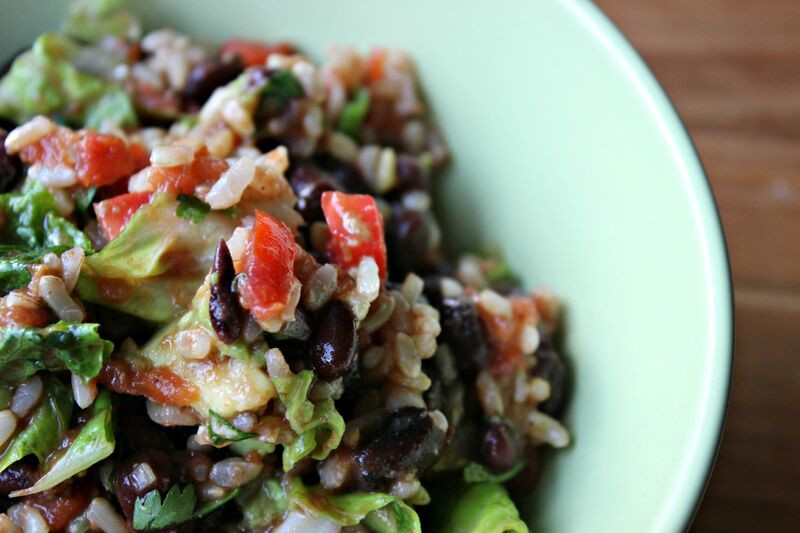 In a large bowl, combine rice, beans, salsa, avocado, and lettuce. Pour the vinaigrette on top, and toss all ingredients together to combine. Serve immediately. If you want to save this for 2-3 days, add the lettuce and avocado when ready to serve to prevent browning and preserve freshness. I can’t wait to try this! Thank you Rachel !! Glad you’re excited about it, Brittany! I think you will really like it 🙂 It’s delicious! Hi, Beth! Another friend made it last night for her family, too, and said it turned out great. I hope you had the same experience! Thanks for the feedback, Jess! This is a great option for lunches or dinners, and I bet Grady will like it, too! So nice to be able to hack restaurant recipies and end up with a healthier and often tastier meal! Definitely! Let me know if there are any other hacks you’re looking for that you’d like me to try. I’m always open to suggestions! Making this for tomorrow nights dinner and my husband is actually excited! Thank you! Laura, thanks so much for taking the time to comment! I’m glad that you liked it so much 🙂 So glad you could make it today! Thanks for the feedback, Danielle! That’s a great idea to use the dressing on something else, too! Thanks for sharing that idea 🙂 I’m thinking of putting a Mediterranean or Asian spin on the burrito bowl concept, too, and I will post if I come up with something tasty! Amazing 🙂 The dressing alone is terrific 🙂 I made the dressing to put on my taco salad 🙂 Thanks Rachel! I have a feeling this is going to be added to the family rotation – so delicious and couldn’t have been easier to put together! The dressing is amazing!! Awesome! So glad you liked it!! Rachel – I loved having you onsite at Cvent yesterday and REALLY loved the Vinaigrette dressing you made to put on it. Certainly makes it easier saying no to the sour cream (which I love). I am curios to know what the shelf-life of your Vinaigrette dressing is? Do you make it in batches and store it for continuous use or do you make it only when you need it? Hi, Lauren! I’m so glad you enjoyed it 🙂 When using that vinaigrette as a salad dressing, I would up the olive oil a bit so it’s at least equal to the amount of lime juice. The “shelf life” of salad dressings varies somewhat. Generally, vinaigrettes can be kept refrigerated for up to 2 weeks. Does that help? It sure does, thank you! I read the whole post and i definitely like to try this delicious recipe at coming weekend. I’m glad! Feel free to post a picture on social media and link this post if you like it! Yeah sure. I will post it on social media and link your post also.